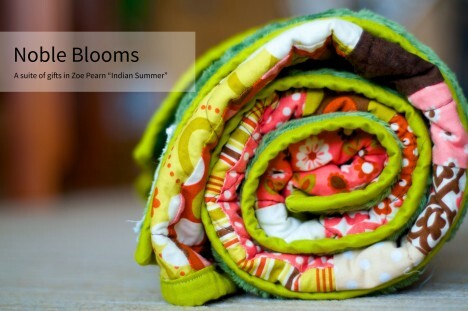 One of my earliest stash purchases was a Rolie Polie of Indian Summer that I’ve been holding on to for the perfect project. Its day in the sun (or perhaps clouds, based on recent weather) has finally come in the form of a quilt for a newborn girl. 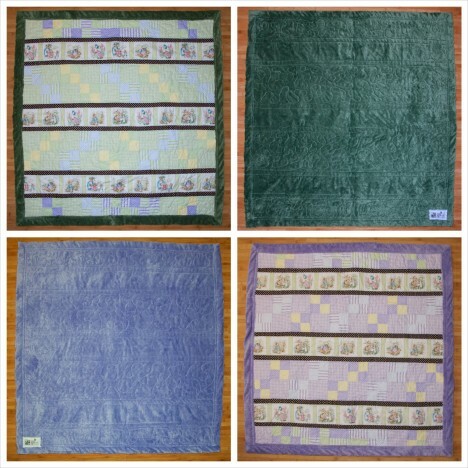 Because the Rolie Polie only had 23 strips, I had to add in one of a coordinating dot from my stash to finish up the strip sets needed for the 8″ blocks. To personalize the quilt, I did a reverse raw-edge applique of her first initial in one corner. The pale pink solid (exact type unknown) doesn’t stand out as much as I’d hoped in the curly, light typeface I used, but that’s okay. You can also see in that corner that I was one block short of the 25 needed for the quilt, so the very last one is pieced from two strip sets. “Noble Blooms” (detail), Rachael Arnold, February 2014, 40″x40″. Photo by Carl Pfranger. 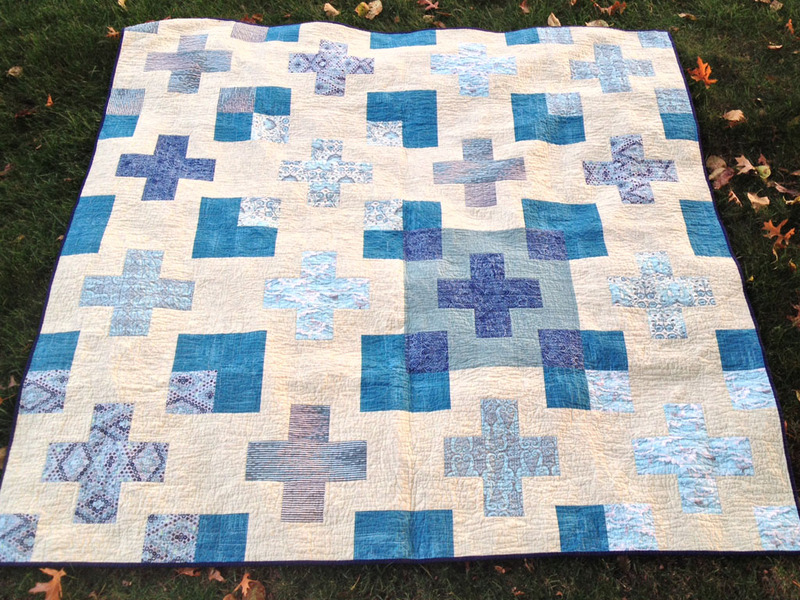 The piecing was a breeze but the quilting was not. 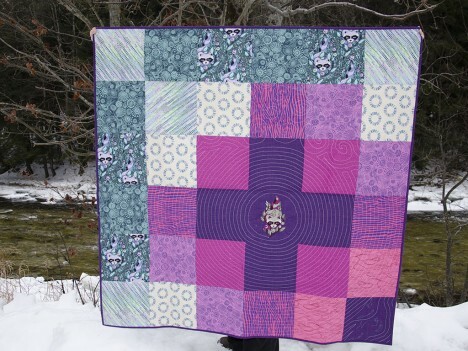 I decided to try a new FMQ design (don’t scrutinize my sloppy first attempt! 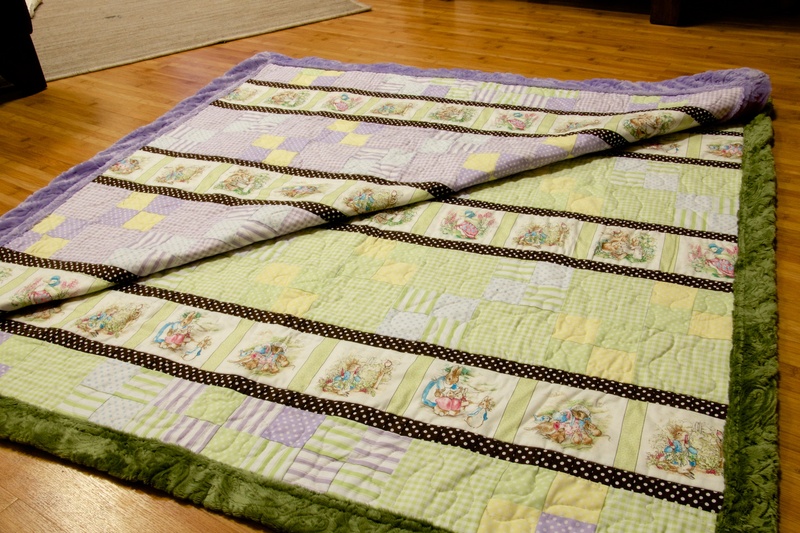 ), so I used leftovers from the top to make a doll quilt/FMQ tester. The tension left something to be desired, but was good enough. 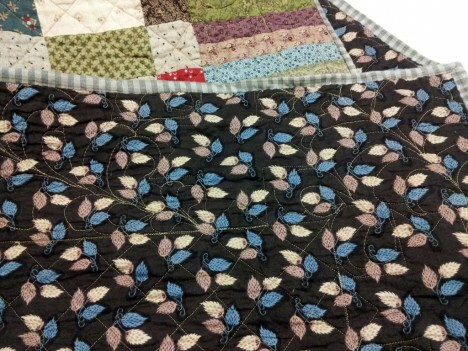 Moving on to the quilt, I broke two needles. Then, my darning foot broke! I was able to finish up the quilting with my floating embroidery foot, but it was rather obnoxious and puts a kink in the progress of other projects. “Noble Blooms” (back), Rachael Arnold, February 2014, 40″x40″. Photo by Carl Pfranger. 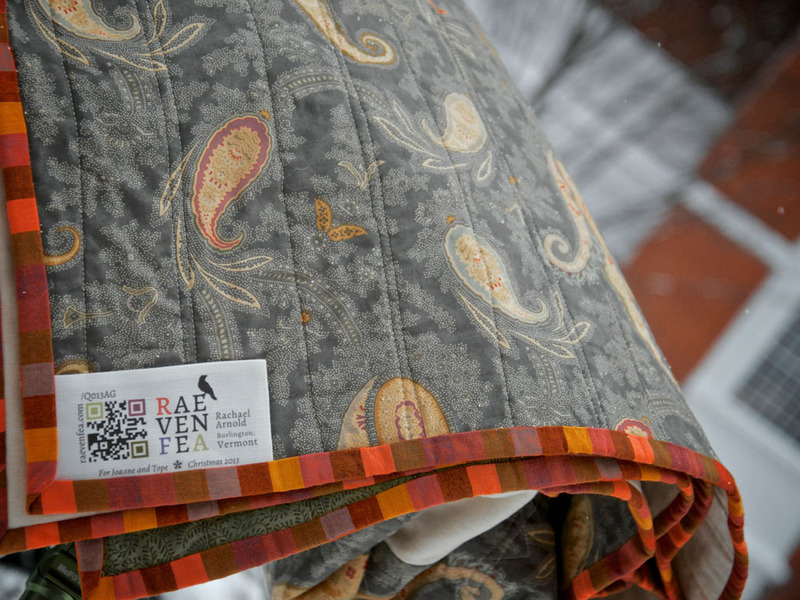 The back is a Minky that came from my stash (actually, the result of an incorrect shipment when I ordered the paisley backing for the Peter Rabbit quilts. Thank you, Fabric.com for your great customer service). In between is a low-loft cotton, likely Pellon Nature’s Touch White or Warm & White—possibly even both, as it’s joined stashed pieces. The quilting was done with a Gutermann brown-to-cream variegated thread. 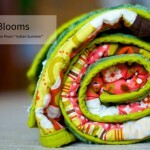 It’s bound in a lime solid from stash. “Noble Blooms” and accompanying items, Rachael Arnold, February 2014, 40″x40″. Photo by Carl Pfranger. 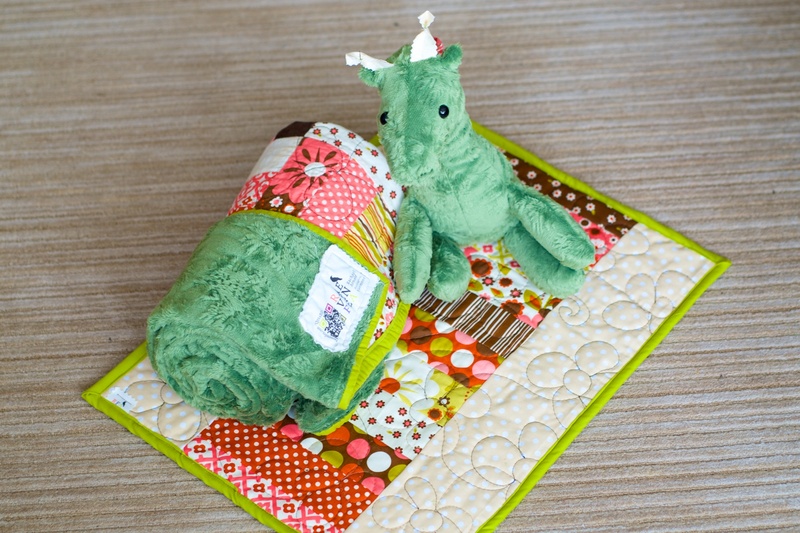 A Minky giraffe made with backing leftovers completes the shipment. 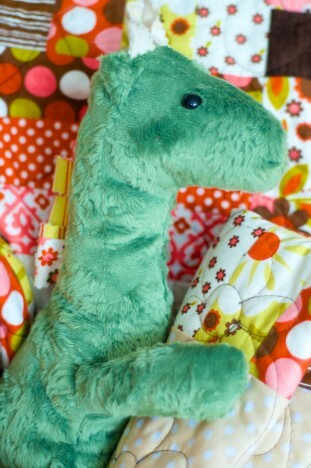 I tried something new with this round of Simplicity 2613 giraffe-making: the ossicones and neck-hair details are made with pinked fabric from the quilt. The ossicones especially worked out so well that I might continue using fabric in the future. As it was, it was a great way of eating up more scraps. 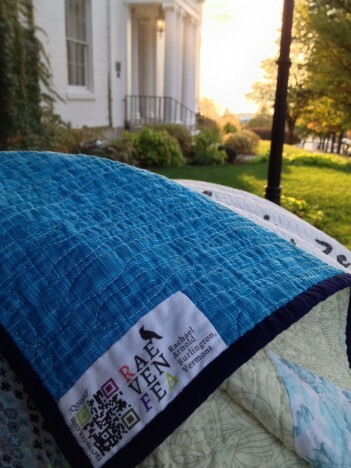 I hear that the Impressions Baby Quilt and stuffie that I sent her sister are well-loved possessions, so I hope that the baby comes to love her own set just as well. It’s probably a bit gauche to mention this when the result is a gift, but this project was entirely from stash—fabric, batting, thread, giraffe eyes and stuffing, … everything. Go go gadget stash busting in 2014! 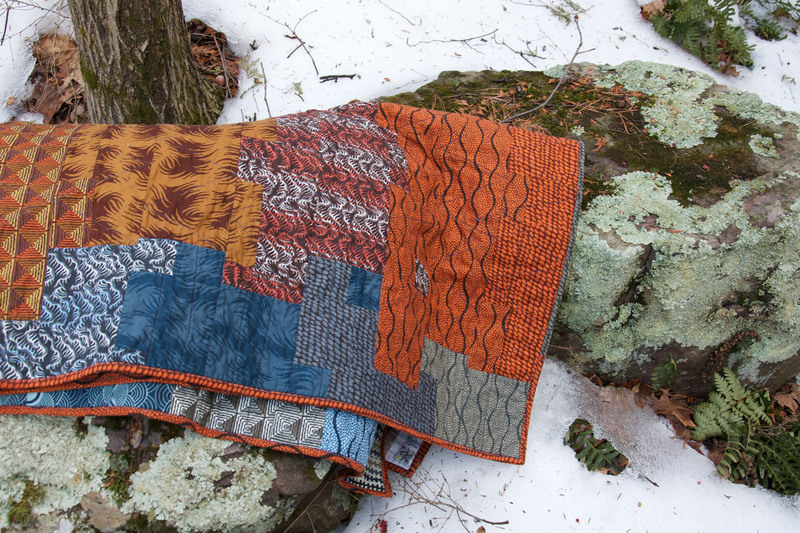 When I made “Disappearing Seven Wonders” last year, I purchased far more fabric than I needed for that top—including prints from the green and orange colorways. When it came time to whip up something for my nephew’s 13th birthday, it was the perfect stack to pull out of my stash. “Wonders of Impromptu”, Rachael Arnold, January 2014, 50″x72″. Photo by Carl Pfranger. 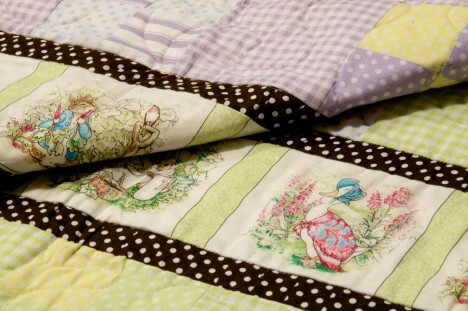 In the past, I’ve always precisely planned out my quilts. 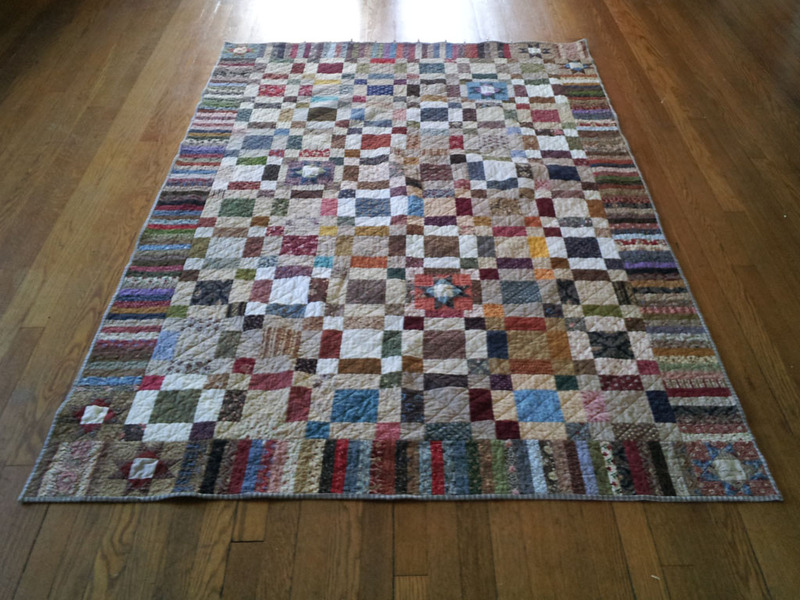 When I set out to do so with this one, I realized that while I needed to aim for a certain final dimension and thus height of the individual strips, the actual piecing didn’t have to be precise. 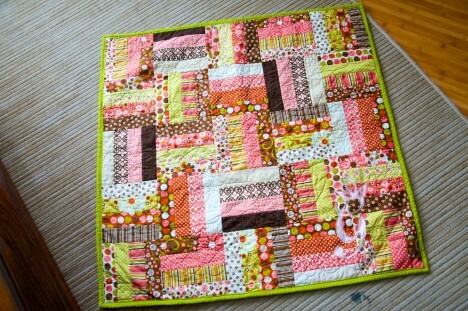 So, I branched out in a new direction and played with impromptu piecing. I worked with 2.5″, 3.5″, and 5″ WOF strips and pieced the different sections without much planning at all. It was a fun exercise. 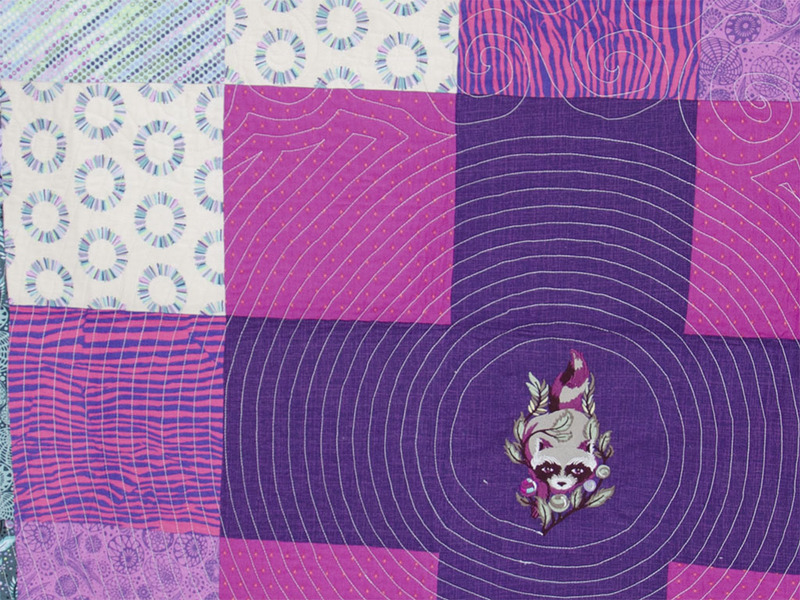 “Wonders of Impromptu” (detail), Rachael Arnold, January 2014, 50″x72″. 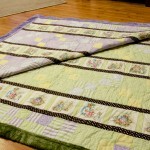 Sometimes I had to chop a bit off, or add a bit more to a strip, because they weren’t the right width for the quilt. Because 2.5″ + 3.5″ is greater than 5″, I was able to trim down different sizes and mix up seams for an even more arbitrary layout. 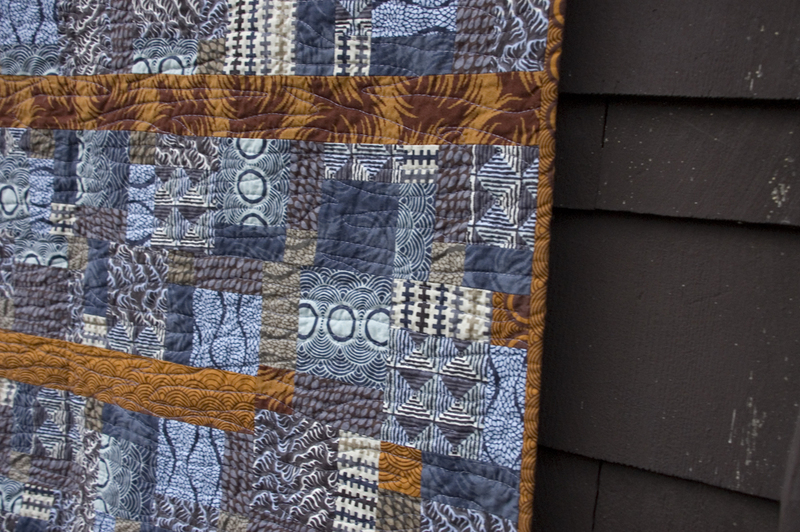 It all ended up creating a fun flow to the quilt, and a more interesting layout than my original thought of simple floating strips. “Wonders of Impromptu” (back), Rachael Arnold, January 2014, 50″x72″. Photo by Carl Pfranger. 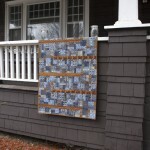 The backing is pieced from a Ty Pennington Impressions home dec print and leftovers from the front. 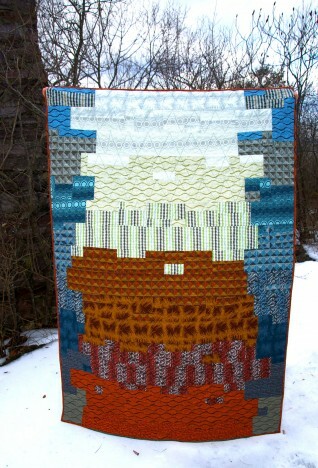 “Wonders of Impromptu” (label), Rachael Arnold, January 2014, 50″x72″. Photo by Carl Pfranger. 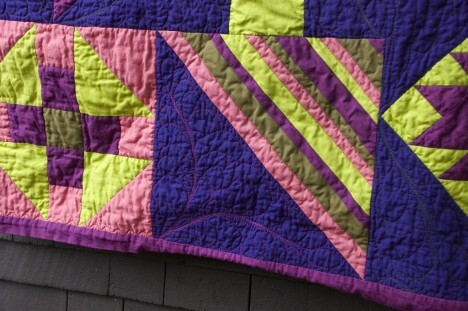 Although this home dec fabric is lighter and finer than the backing on my last quilt (Thorny Patchwork), I chose to stick with straight-line quilting on this one to avoid more annoyances with broken needles. It’s slightly less dense than most of my recent projects, but still has a nice drape thanks to the low-loft cotton batting (Warm & White or Nature’s Touch White—possibly both—since I pieced it together from scraps in my stash). 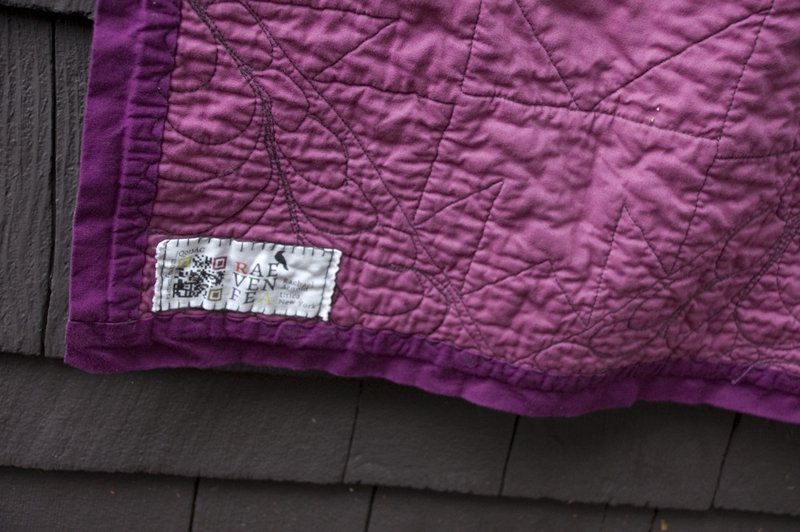 “Wonders of Impromptu” (detail), Rachael Arnold, January 2014, 50″x72″. Photo by Carl Pfranger. I wanted to make sure it was in his hands by his birthday (I’m notoriously late in sending birthday cards, but managed to send his two sisters’ quilts on time last fall), so I machine bound this. It’s not perfect, but it is secure and looks fine from the front. 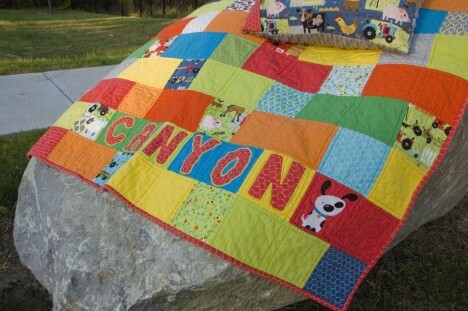 Now it’s time to focus on a handful of baby quilts for recent births and others due soon! It seems that no quilting year is complete for me without at least two Tula Pink quilts. 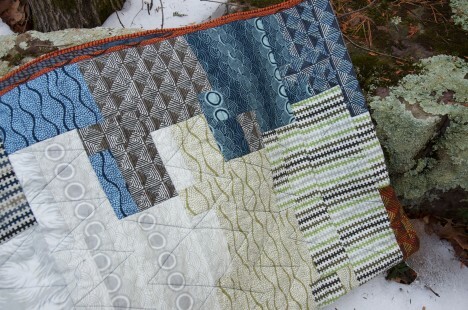 Last year, I made Tula Does Up the Walls in Pah-ree then followed with Superfluous Tula, both using Parisville. 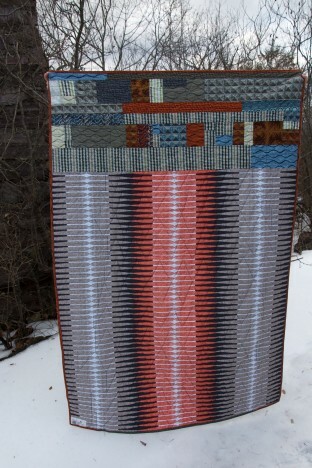 This year, I finished quilts using two different lines; C++ used Saltwater, and this latest quilt is Acacia. 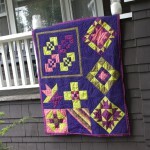 I call it “Thorny Patchwork”. “Thorny Patchwork”, Rachael Arnold, finished December 2013, 50″×50″. Photo by Carl Pfranger. I picked up the six-pack of fat quarters a while back with no project in mind. 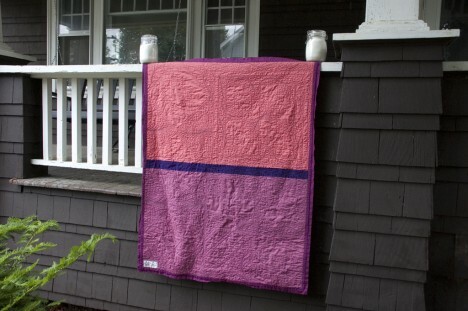 They paired well with a bit of leftover the Birds and the Bees, a zebra print, and unknown origin purple linen texture, all from stash. “Thorny Patchwork” detail, Rachael Arnold, finished December 2013, 50″×50″. Photo by Carl Pfranger. My plan was to use 9″ squares (8.5″ finishing), but the store that sold the FQs was very judicious with their cutting and after I squared up, I had a bit less than 18″ to work with. The finished squares are 8.25″, making a 50″ square quilt before washing. Urban Threads sells a few embroideries based on this line, so I stitched out the raccoon in the middle of the purple plus to fill the space before I sandwiched the top. 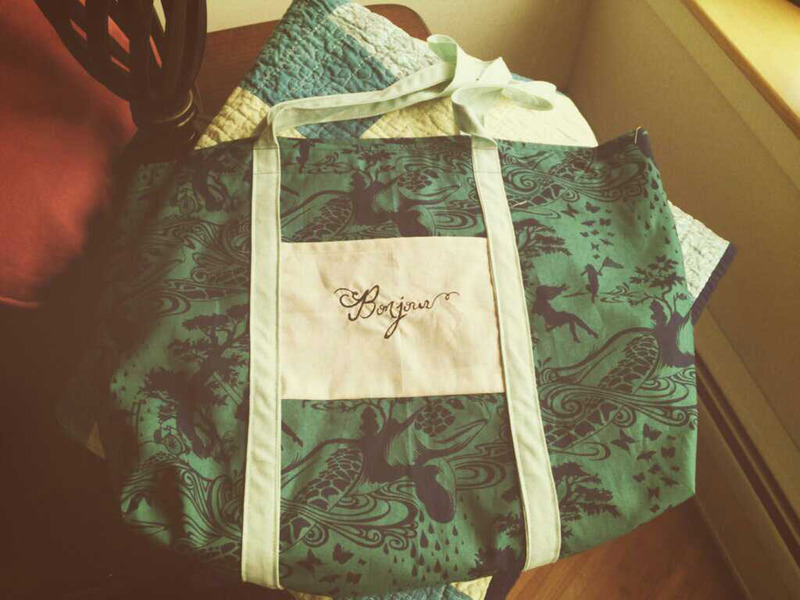 The 44,000+ stitches took three bobbins and three hours to stitch, and I didn’t even use the largest size embroidery! The finished design is worth it. 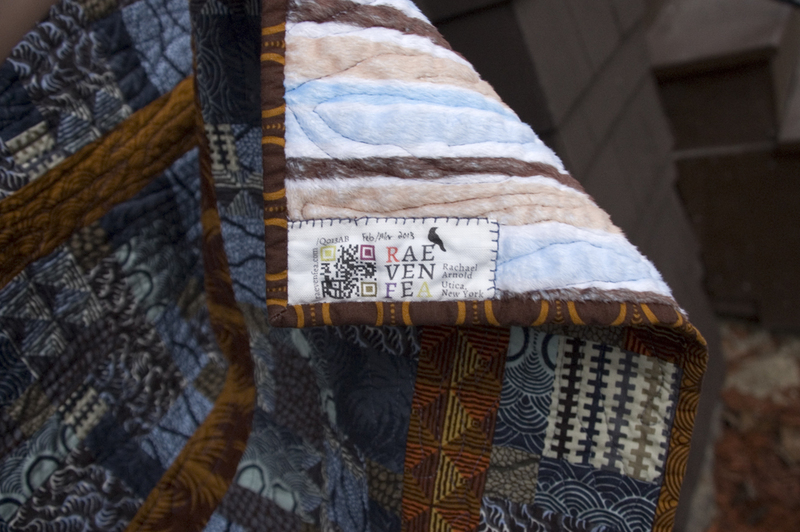 “Thorny Patchwork” back, Rachael Arnold, finished December 2013, 50″×50″. Photo by Carl Pfranger. The back is a print I picked up on my last trip to Ikea. It’s a canvas, which is where the thorny bit of the title comes in (aside from a play on words with Acacia). 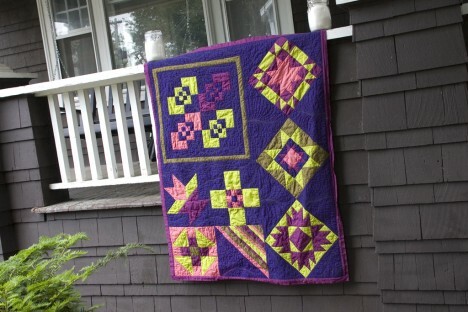 I broke eight needles of various types and sizes trying to FMQ this. 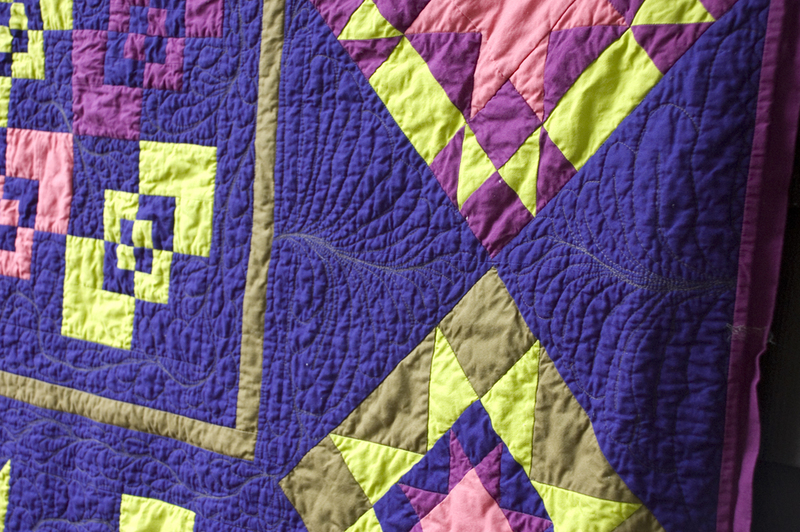 A bit of planning combined with a lot of luck saved me: I started in a top corner, so I was able to switch to my walking foot after the eighth needle and it looks almost like I intended it to be quilted that way. 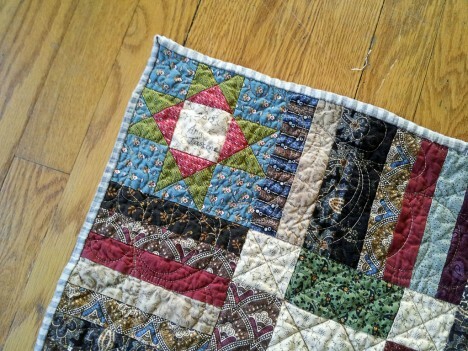 Once I switched to the walking foot, I didn’t have any more issues with the needle or tension. 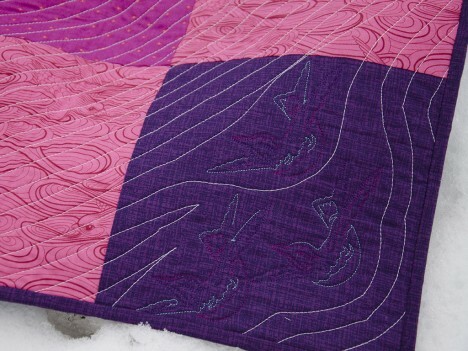 Mixed in with the quilting are a few embroidered swallows (also from Urban Threads). 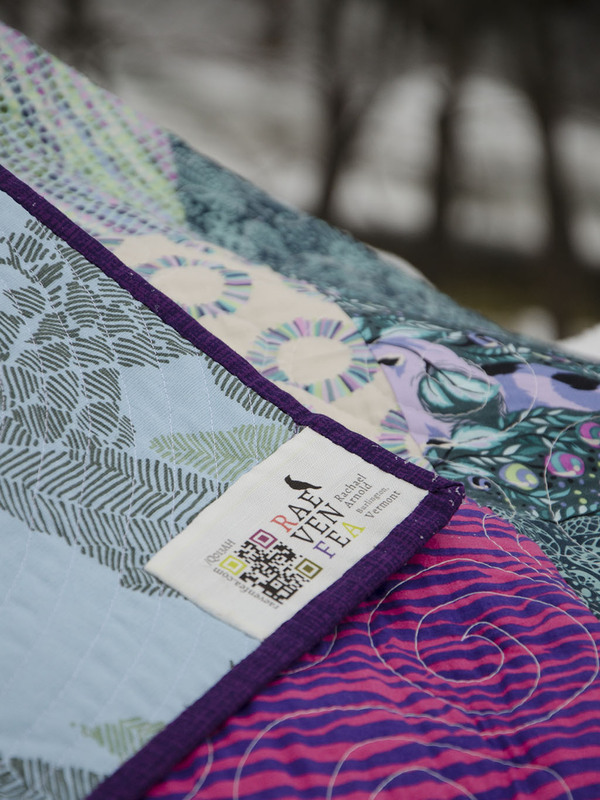 The corner ones are in a variegated embroidery rayon, while the other two and the rest of the quilting is Aurifil 28wt (with cotton Gutermann in the bobbin). 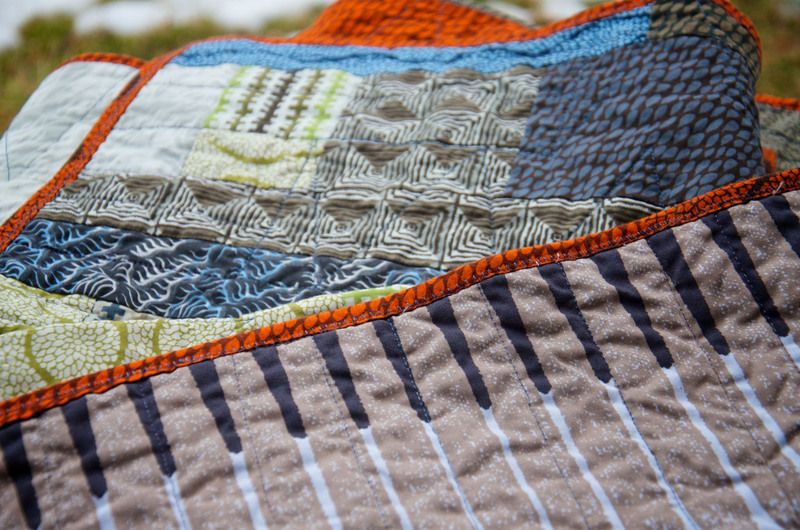 I planned to use a variegated for the overall quilting, but was thwarted by numerous tension issues—again, likely because of the backing. This was a fun, quick project to finish up the year. 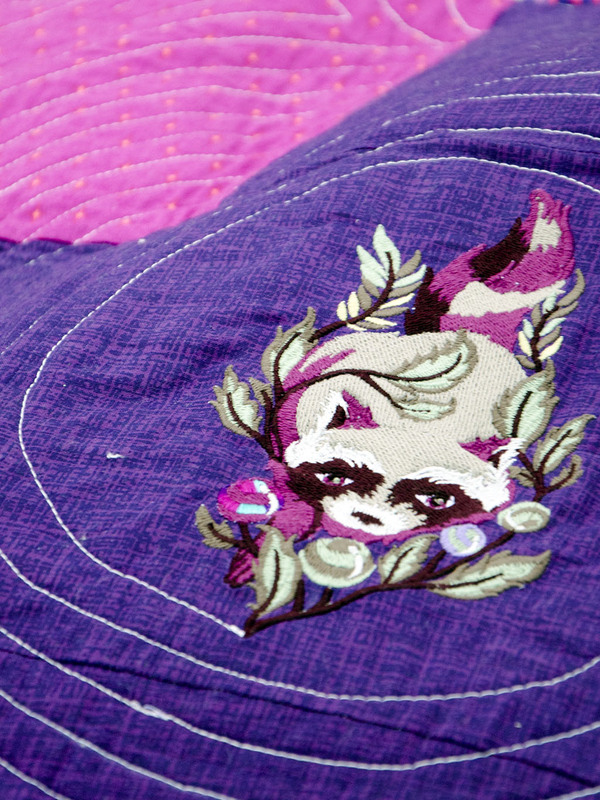 The only non-stash component was the raccoon embroidery file; all of the various threads, the Nature’s Blend batting, the swallow quilting embroidery file, and the fabrics were in my stash. All that is left is boxing it up and mailing it to a niece for her birthday next week! 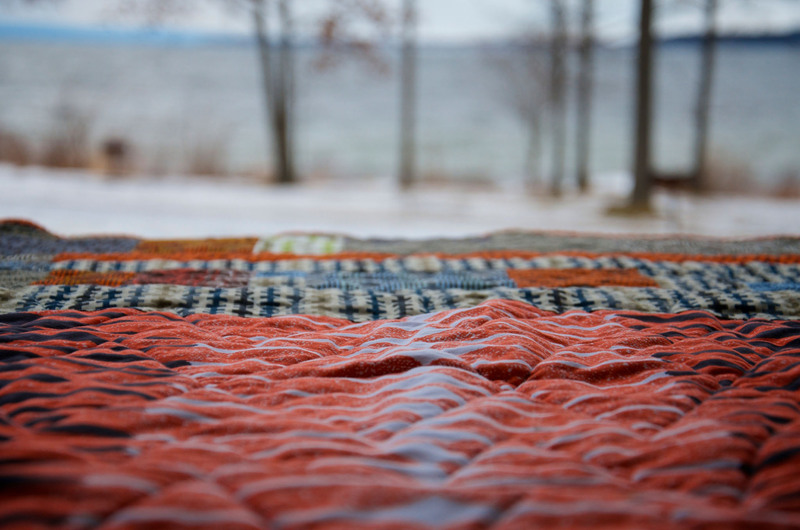 When I purchased a charm pack of Metropolitan Fair by Barbara Brackman this summer, I knew it needed to be paired with linen, but the proper pattern eluded me for months. 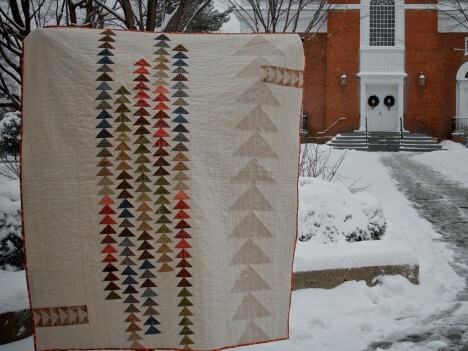 Then, though I am not a trendy sort, I couldn’t help but being inspired by the recent flock of flying geese quilts showing up on Flickr, Pinterest, and in my RSS reader. Reproduction Sky was born. “Reproduction Sky”, Rachael Arnold, finished December 2013, 60″×70″. I turned 39 of the 42 charms into 168 flying geese (the remaining charms and a few unused geese are on the back), paired it with one light linen/rayon blend, a darker 100% linen, and just a bit of a FQ from Old Sturbridge Village that has been in my stash for a while. “Reproduction Sky” detail, Rachael Arnold, finished December 2013, 60″×70″. Photo by Carl Pfranger. I think it took longer to cut and trim those flying geese than it did to sew the entire quilt top together. 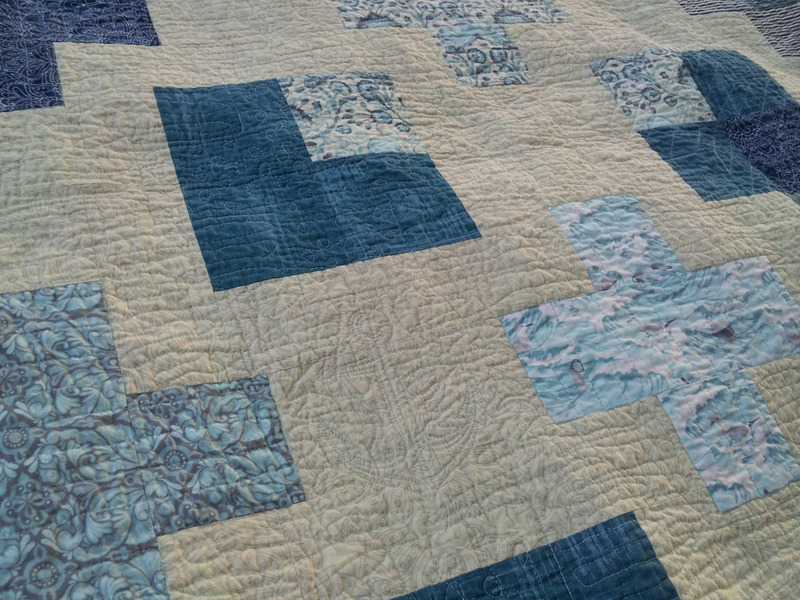 Among other imperfections, I didn’t baste the back on perfectly straight, so the piecing of it is a little skewed when compared to the vertical quilting from the front, but it’s not too bad. I had just shy of three yards of this Etchings print in stash, as well as the green vines, which made for quick piecing of the back. 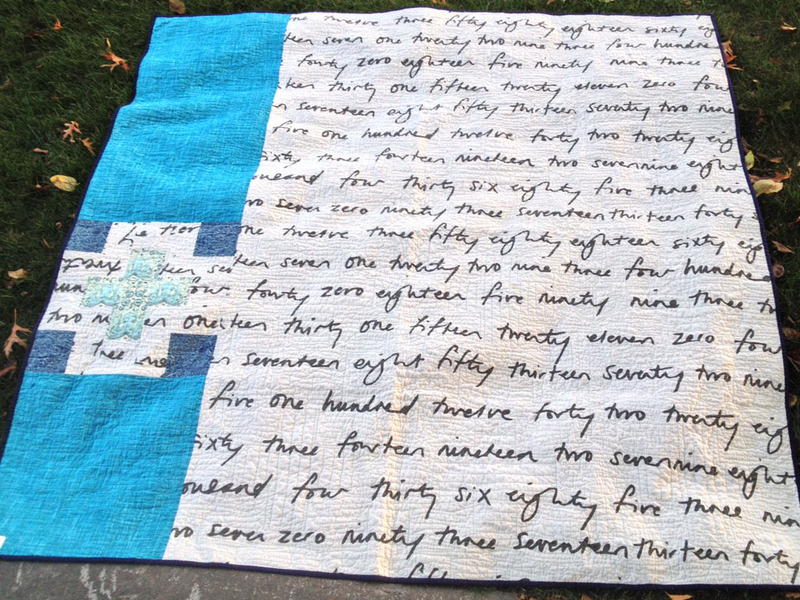 “Reproduction Sky” (back), Rachael Arnold, finished December 2013, 60″×70″. Nature’s Touch batting gives it a nice drape. The quilting is a mix of 40wt Gütermann thread and a 28wt hand-dyed white to beige variegated thread I picked up at a local quilt show. The latter was used to echo the seam lines of the geese columns and continue that grid to the edges, while the lighter-weight thread was perfect for a few more lines in between the others and stitching in some ditches. “Reproduction Sky” detail, Rachael Arnold, finished December 2013, 60″×70″. This one isn’t staying around the house for long, as it’s intended as a Christmas present for some friends of ours. I do look forward to cuddling under it while I finish up the binding. I cheated in the photos by using Steam-a-Seam to fuse the binding to the back. 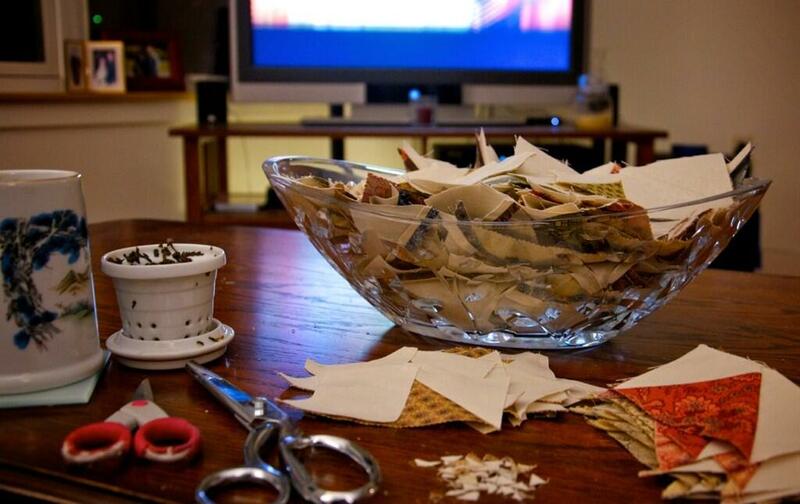 Not only does it clean up the binding for photos, but it holds it in place perfectly when I hand sew it down. 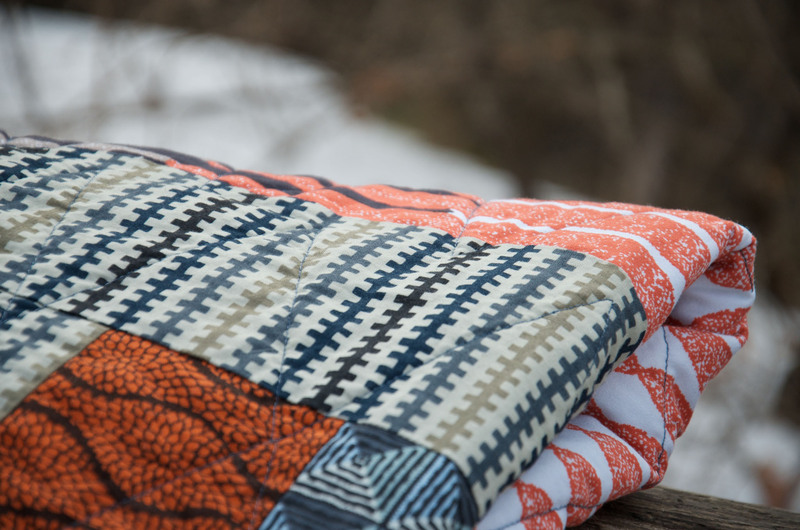 With 6″ of snow on the ground and more forecasted, sewing binding while sitting under a warm quilt sounds lovely! 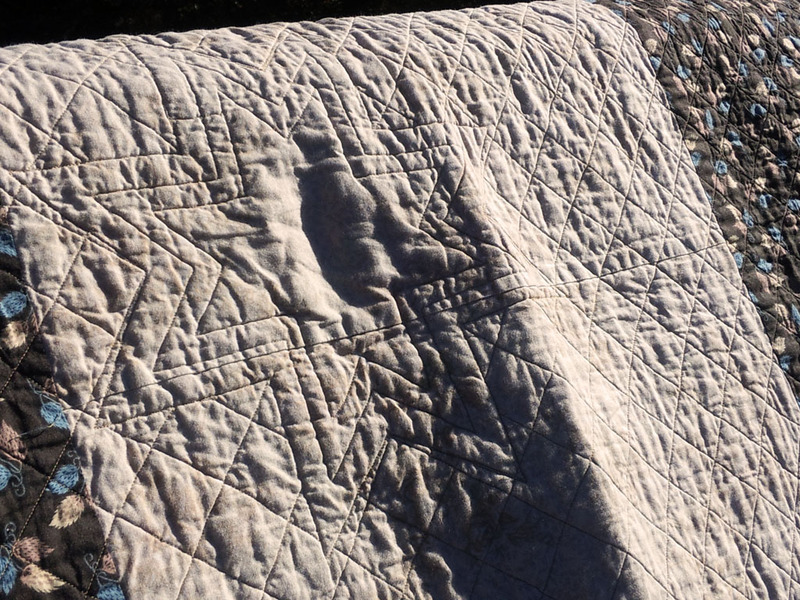 I’ll spare you a lengthy essay on the quilt title, but the tl;dr of my stream of consciousness was something like “for CCC / double plus / C++? / cout << 'Hello Triple C' / okay, C++ is good enough before you get too far down the rabbit hole and start an i/o stream of odes to unorthodox programming syntax and 'doubleplusgood's and other 1984 references. / Wait, Sea++? Get it? 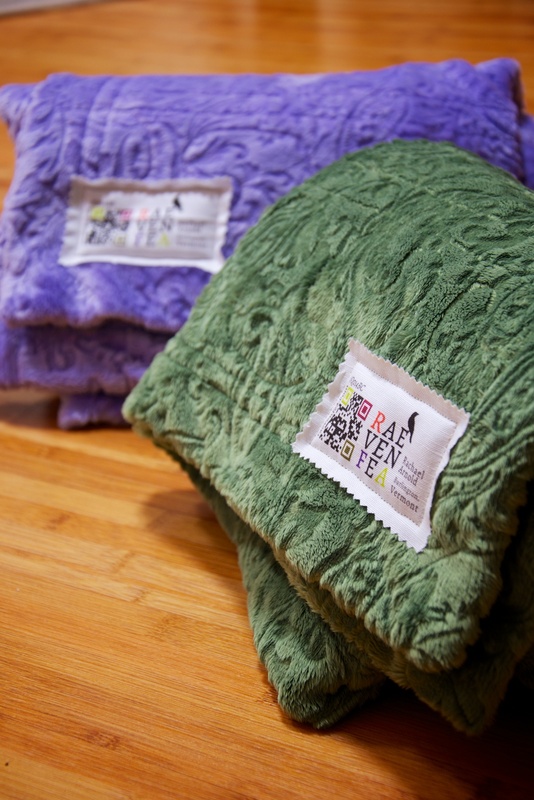 Salt Water, like from the sea… no, really, just stop." My mind: a confusing place since forever. 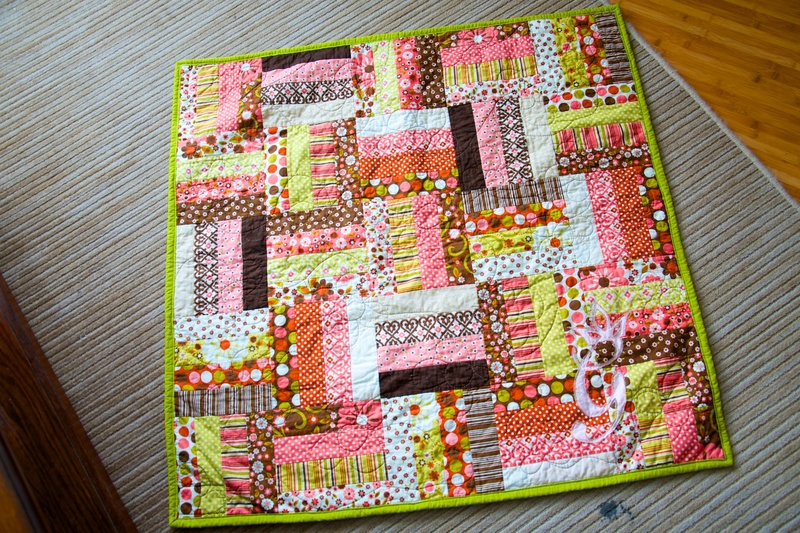 But as the start of that stream of consciousness reads, this quilt is for my sister Courtney, also known by her initials as CCC or Triple C, and the quilt was inspired by one titled “Double Plus.” She’s been waiting patiently for a quilt since I made the ones for our mom and other sister back in May 2011 (plus the other fabric things I’ve made Kaite), so I’m glad inspiration finally hit! It all started with a six-pack of FQs from Tula Pink’s Salt Water line. I threw in a bit of shot cotton (maybe a Moda Cross Weave?) 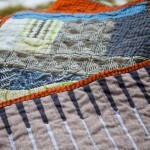 and Kona Nautical as binding from my stash. Rounding out the fabric choices are yardage of another Salt Water print for the background and Laura Gunn Painter’s Canvas for most of the block corners. Ideas floated around in the ether for a bit, always coming back to plus quilts, so when I saw “Double Plus”, the idea took shape. 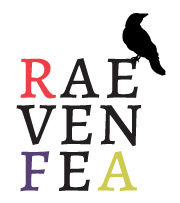 A few rounds of digital sketching later, I had the plan to execute in 70″ square form. This yardage from IKEA has always been slated for the back of Courtney’s quilt, even before there was an idea for the quilt front. My brain decided it, and so it is. 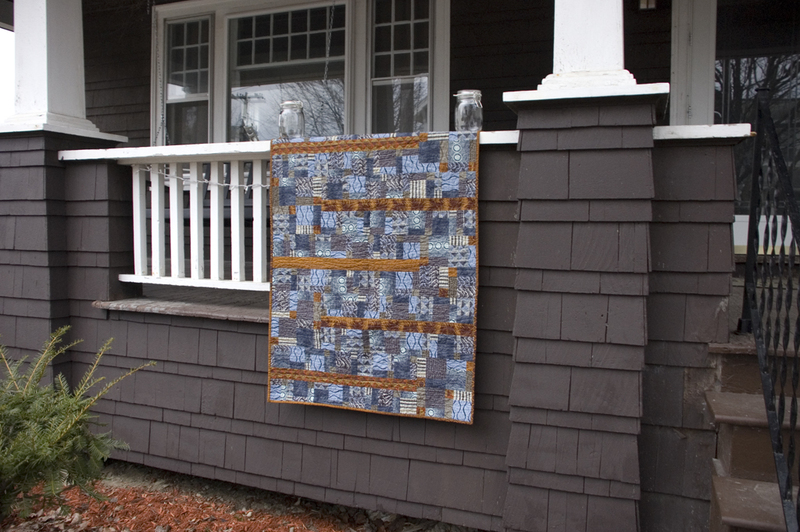 The piecing was less about intention and more about making the fabric I had work for the back—particularly without another trip to the store. 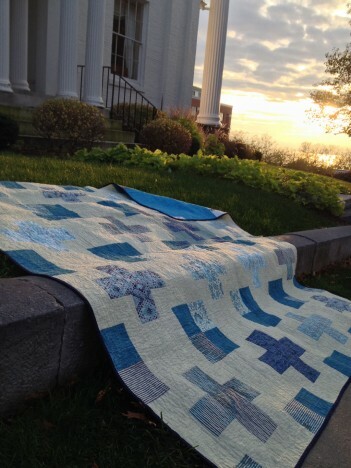 The blue is a textured linen-like cotton that has been in my stash for a while, previously seen in Carl’s bag. Had I remembered it was there, it likely would have ended up on the front as well instead of the Painter’s Canvas. Case in point: I need stash organizing, stat. 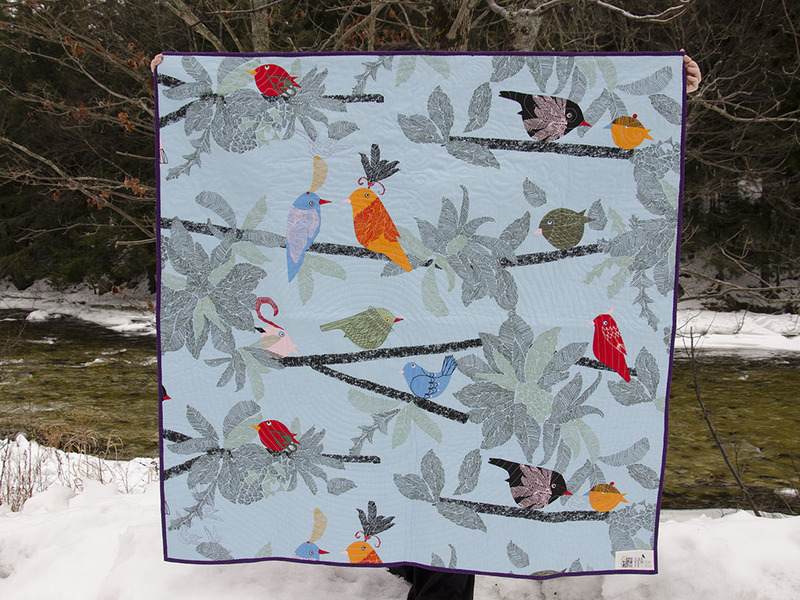 I picked up a spool of Isocord thread to quilt with and I really like the results, but had to battle a fair number of tension issues. 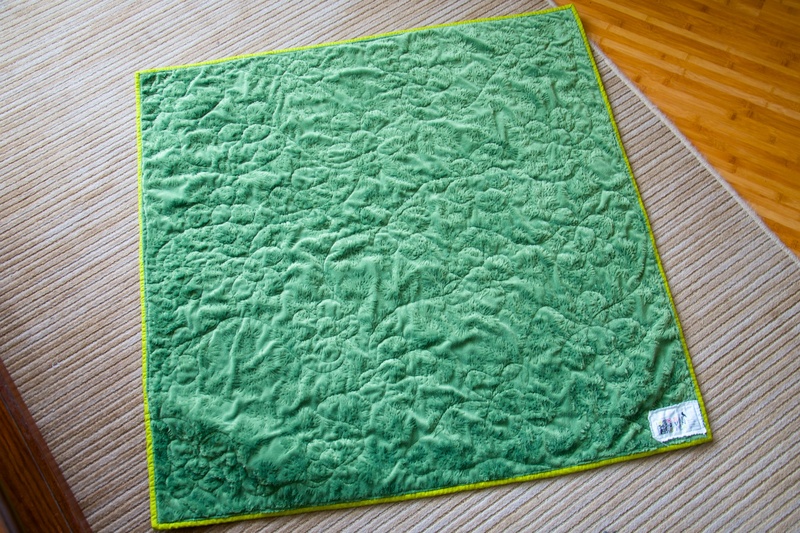 This also isn’t my best quilting because I tackled it all with my free-motion foot—even the straight and stitch-in-the-ditch parts. I need much more practice with doing straight lines that way, but now that it is washed, all the little mistakes aren’t obvious. Tula paired up with Urban threads to offer some embroidery motifs that pair with the line, including a quilting one, so I mixed it in with my FMQ. I planned to do more, but those tensions issues made me modify that plan. 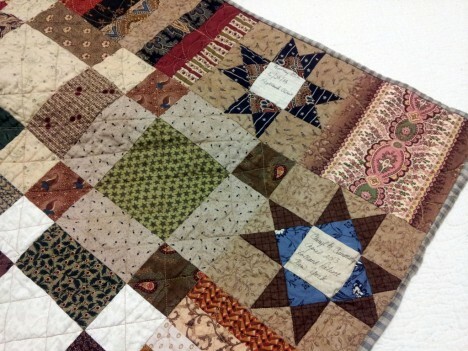 There are still a few anchors mixed in the quilting. 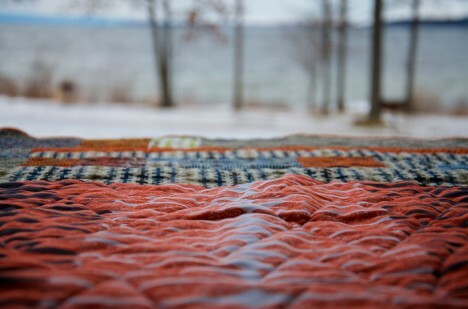 The final wavy texture is amazing and it drapes beautifully. It’s hard to part with, but nothing but the best for my very favorite oldest younger sister who is infinitely patient. 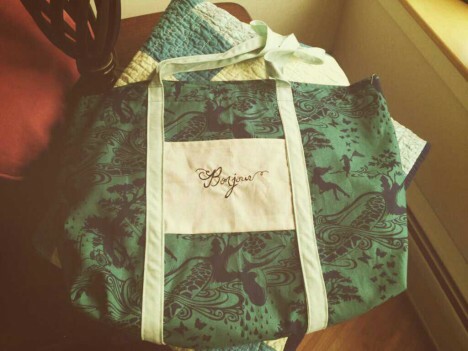 To top it off, I threw together a quick tote bag from another bit of Tula Pink—the Turtle Bay print from Prince Charming—paired with a stashed solid (I’m not sure what), another embroidery from Urban Threads, and lined in the Ikea text print. I made her a zippered cosmetic bag from this same print earlier in the year (but never photographed), so it all ties together pretty well. That’s three quilts in three months. Can I keep up the trend? 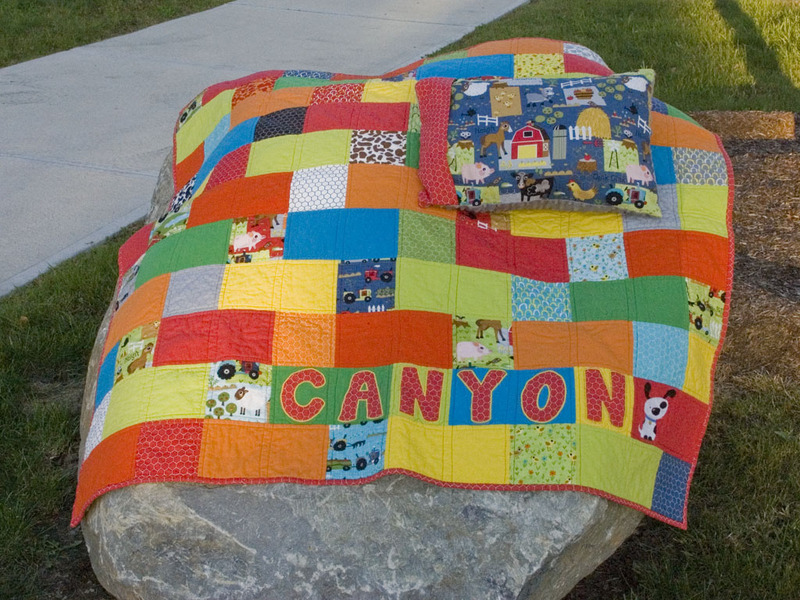 When you are the one who makes the quilt from start to finish. You know its story; the whys, the hows, the whats—they are all part of the narrative born from your choices (of course, how that narrative is interpreted by others is another story all together). But for this quilt, I don’t know the whole story. I only made ~1/10th of the blocks in this quilt. The rest came from other women who endued them with their own stories that aren’t mine to tell, but I can tell you the story of turning the blocks into a quilt. My contribution to the story is all about traveling. I travelled outside of my comfort zone to work in Civil War reproductions, and at a level of piecing quality that I felt comfortable handing off to other women. While some of the fabrics came from the LQS that hosted the swap, others came in my travels around the country—every where from MA to KS, and various parts of NY. 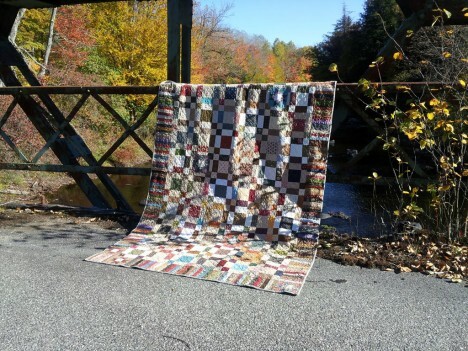 The fabric that I included in two corners is one of those; it came from Old Sturbridge Village, and wasn’t intended for this quilt until I realized I had miscalculated how many piano keys I needed when I donated spare blocks back to the group for a charity quilt. I think it works perfectly. Measurements travelled a bit, too. Particularly with the piano keys, the blocks weren’t all perfectly square. The borders worked out, but not according to my original plan. 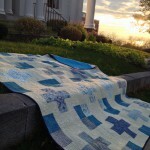 I had fewer stars than expected, as three women decided not to continue the swap (it was a busy spring! ), but it worked out fine in the end. 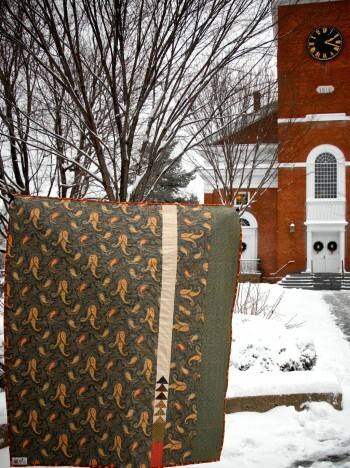 …and then back to NY this past weekend as I completed the hand-sewing portion of binding while volunteering at the Mohawk Valley Quilt Club’s biennial show. I tried photographing it at a beautiful old bridge spanning a river in the Adirondacks as we travelled back to VT, but it was late and the shadows were overwhelming the details. There was a bit of dye that traveled from red fabrics in the border to the thread and lighter fabric on the back of the quilt (barely noticeable). 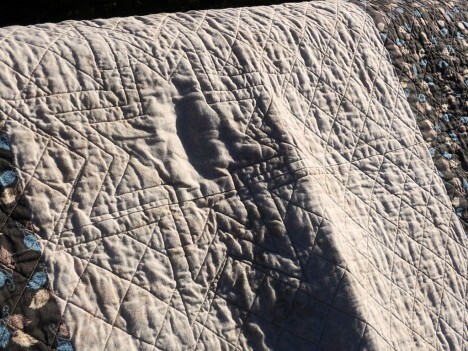 Because of the cotton batting (Pellon Nature’s Touch), the measurements travelled a few inches after washing, too, shrinking to 58″ x 89″ from the 60″x92″ pre-quilted, pre-washed size (a generous twin-sized bed quilt). 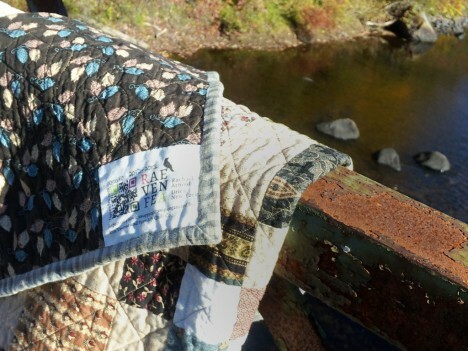 I traveled to the store three separate times for quilting thread. 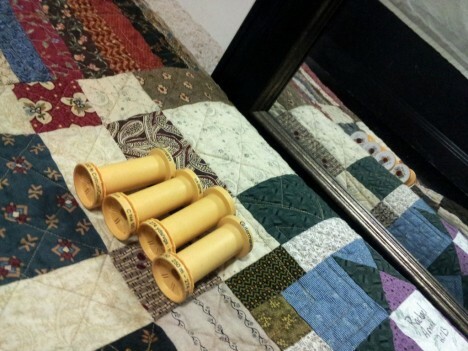 I started with a spool that was previously used, and forgot just how large the quilt was, and how much thread it would take to quilt. I used up the fourth spool while sewing the binding to the front of the quilt. The quilting is simple, with a grid in the center based on the seams in the uneven nine-patch blocks, and feathering in the borders. 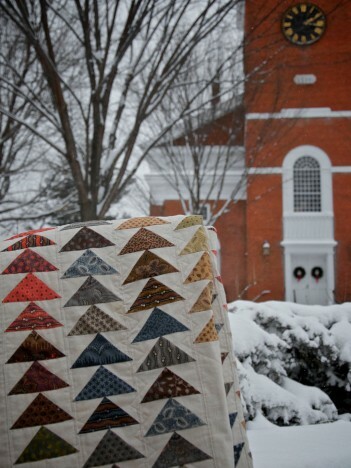 The stars are outlined in both locations, with some echoing in the center of the quilt, breaking into the grid. It’s done traveling for now. 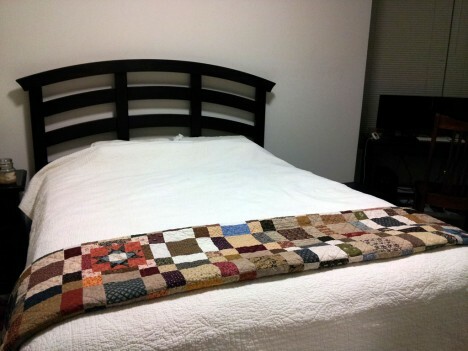 Its current home is adding a bit of color to our very neutral bedroom. (There’s a problem with moving from a house full of colorful walls where you buy neutral decor to balance it out to an apartment with beige walls: you end up with one big palette of blah.) But, I’m sure it will have future stories of traveling to tell. After all, I still need to get better photos. 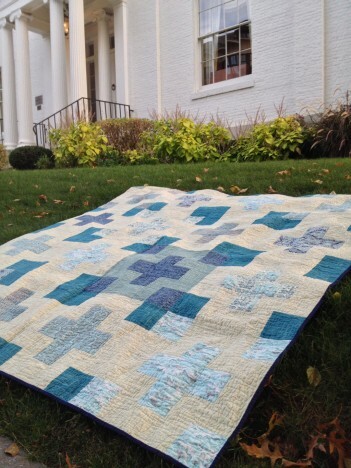 Three years ago, I made my first quilt. 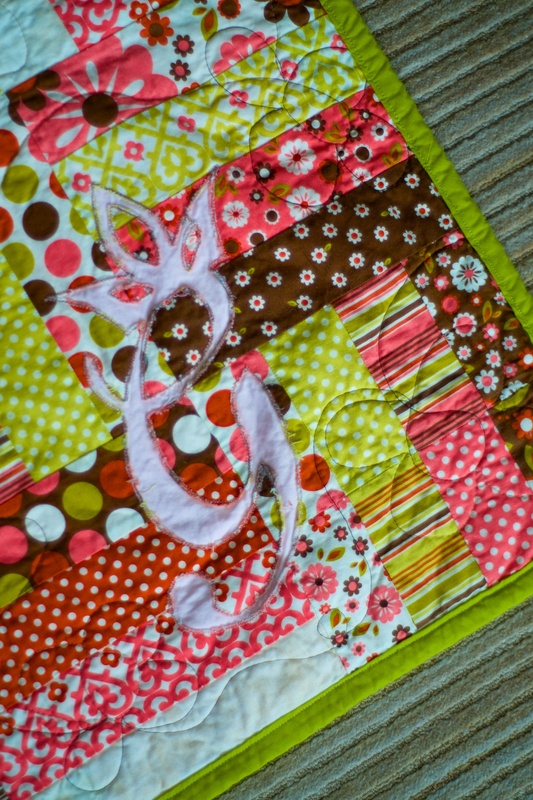 I knew nothing about quilting but a fair amount about sewing fabric together, so I dove in, read a bit, and ended up with something that wasn’t half bad. I also made mistakes, particularly using fabrics that couldn’t handle the love its toddler owner has given it. 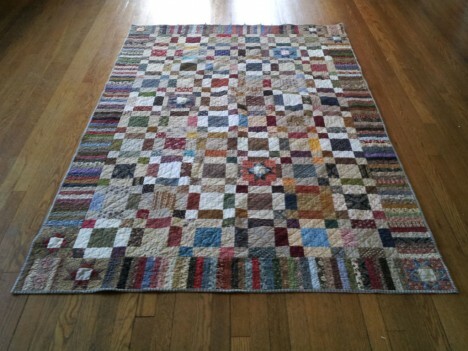 So, three years later, that same recipient is getting a second quilt—my nineteenth quilt finish (if I counted properly). 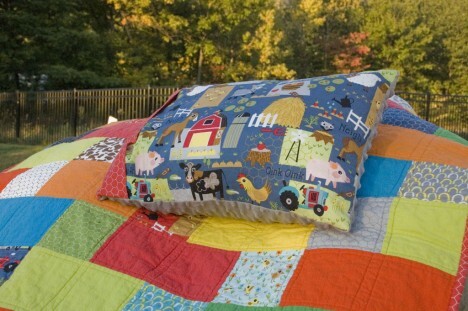 I’m still not one to use solely quilting cotton. The solids in this quilt are flannel, and the back is Minky. But, those hold up pretty well, unlike silk. 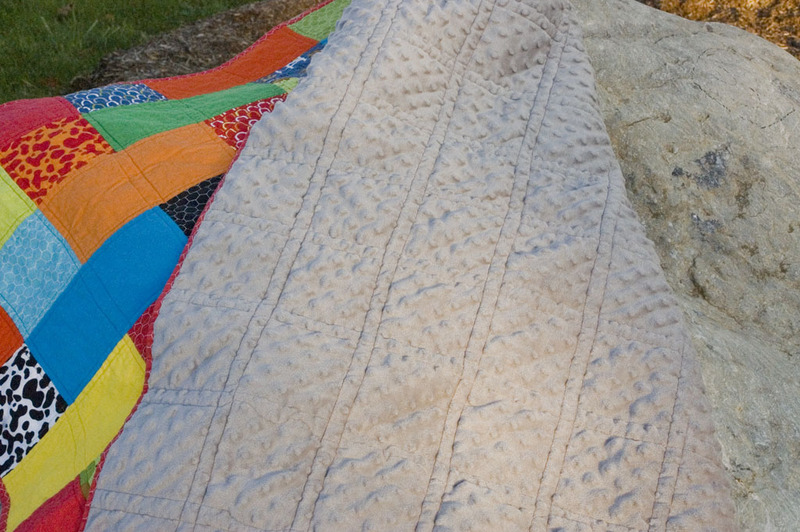 The batting is low-loft cotton (Warm & White, mostly because I had it on-hand in the right dimensions); that first quilt is probably the only one I will ever use a high-loft poly on. His name is appliqued, but done so with the embroidery capabilities of my machine, rather than manually (I’m using the excuse that I needed to test out my machine post-service; I’m not sure that it was any faster that way, considering the rehooping and trimming, etc.). 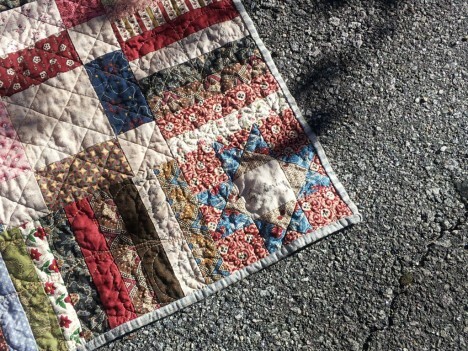 An embroidered dog keeps it company. 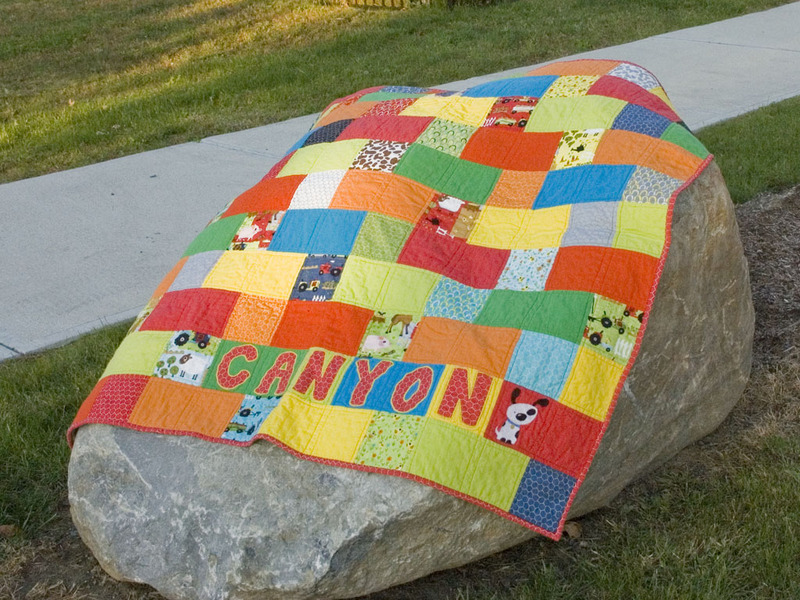 The quilting is a simple seam-line echo, in four of the colors from the quilt top; red, orange, yellow, green. There was no rhyme nor reason, those are just the colors I had that matched and didn’t have enough to use just one color. 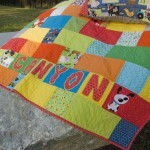 I went through an extra spool of the yellow, though, doing the applique. 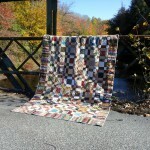 I bound it in one fo the prints from the line, a red chicken wire pattern. When all was said and done, I still had a lot of that red, a matching FQ of one of the animal prints, and a bit of extra Minky, so I threw together an envelope-style pillowcase for a travel-sized pillow to match. I had to add a hidden bit of velcro to keep it properly closed, as the envelope overhang gapes when the pillow is in there (I was winging it, measurement-wise). In the future, I want to play around and see what the minimum overlap is for that; it seems like an interesting problem to solve. 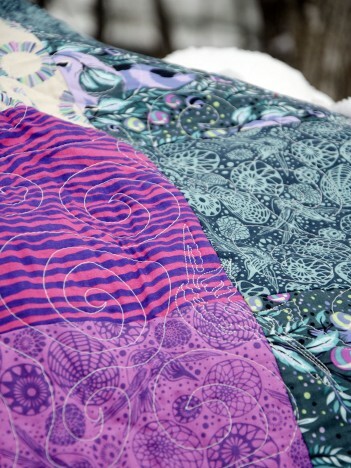 Three years, nineteen quilts (plus some minis and many other projects), but I think I’m just getting started considering I’ve already quilted another and am in the middle of one more at the moment! I described this quilt pretty thoroughly in my last post, so I’ll skip the long paragraphs and just show you the finished, post-wash photos. 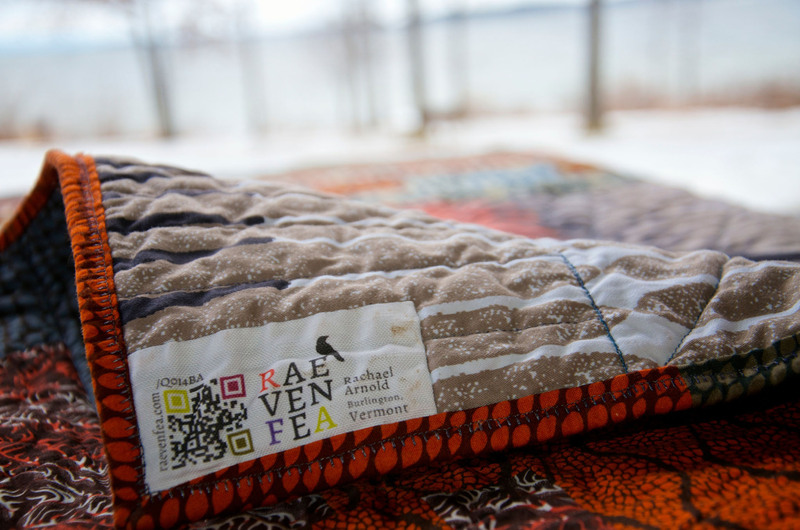 All of the Regal sections are feathered, most of the seams are stitched in the ditch, with the light fabrics free of quilting. 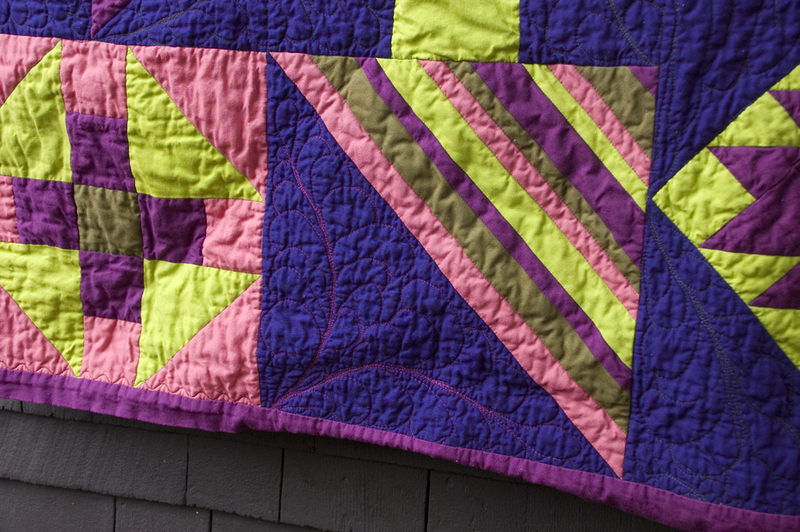 The strip block needed just a little something more, so I changed thread colors to give the large triangle a bit more color. 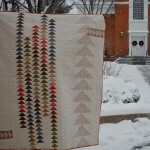 Now that it is washed, my feather stitching messiness isn’t quite as noticeable. I’m not very happy with how the binding turned out. It is very limp. 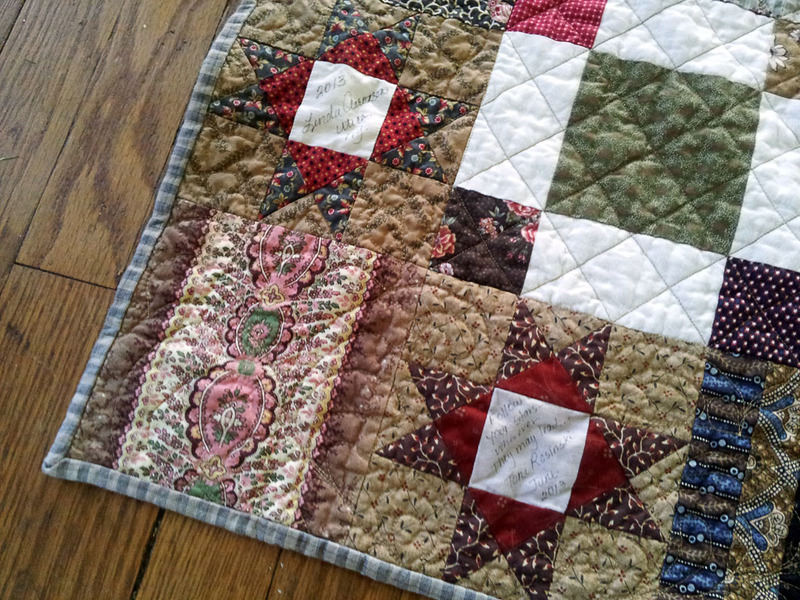 I made it so wide and un-mitered as a nod to Amish quilting, but I should have found a way to pad it. By the time I got to the binding, I was so done with this quilt, so I machine sewed the binding on. It worked pretty well with the serpentine stitch. So, that’s that. Now I just have to decide which of Carl’s nieces is getting it. 2013 finish number three! I really can’t turn down any idea that brews in my brain involving Parson Gray fabric. 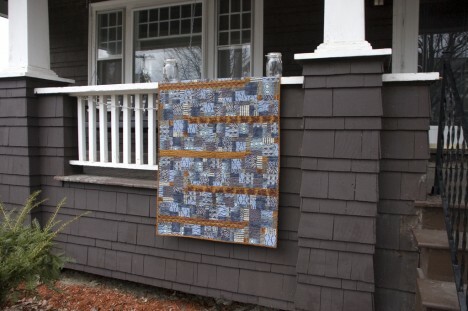 When Carl mentioned that a friend was planning on decorating her baby’s room in blues and browns, I knew I had the perfect excuse to buy a few half yards of Seven Wonders. 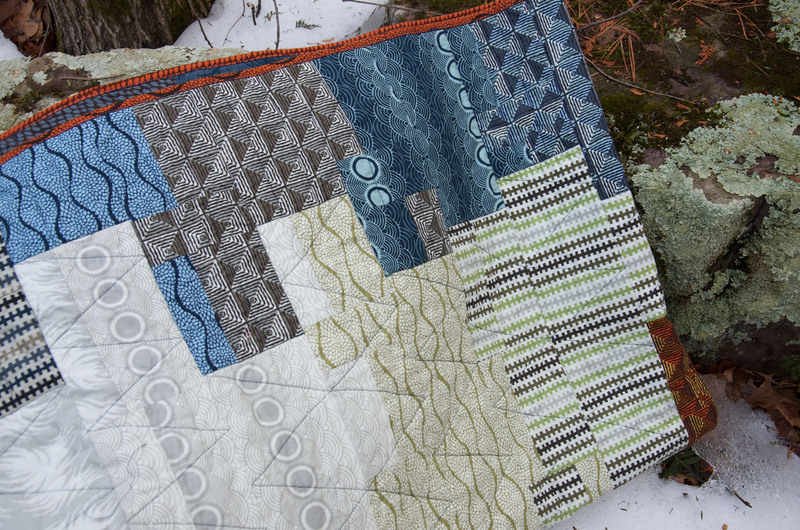 I put together two sizes of disappearing nine patches—10″ and 8″—bisected by 2″ strips. It went together rather quickly on the retreat I went to in February. 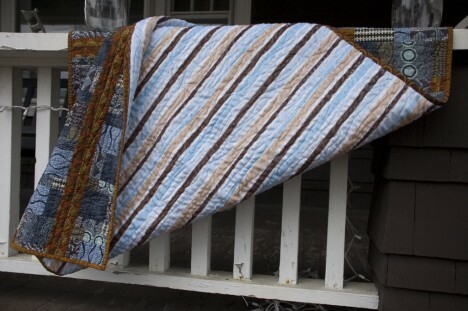 Being a baby quilt, I backed it with a Minky-style fabric of blue and brown stripes. Because the background is white, the result was a less-than-opaque backing, so I threw an 80/20 blend batting in between (I think it is Pellon Nature’s Blend, but it was a scrap from something else, so I’m not positive). 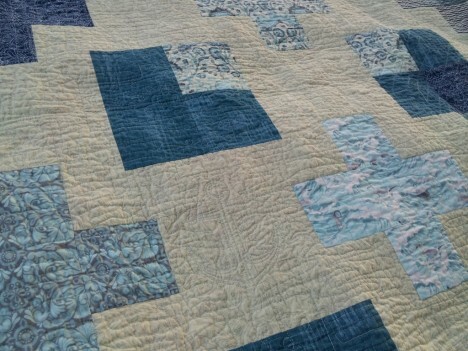 The quilting is an all-over wave-like pattern in a blue/white variegated thread (technically meant for denim). It crinkled up nicely, even with the bit of poly in the batting and backing. Topping it off is a new label. I’m planning on telling you more about that later this week. Now to pop it in the mail! I’m a few weeks late, but I doubt the new baby boy will mind. That’s finish number two for the year. Time to get back to some WIPs.